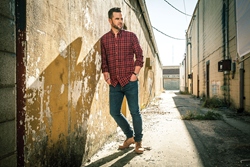 David Nail will perform Sunday July 3, 2016. Nail is considered to have one of the most distinct and powerful voices in country music today, releasing his third album, I’m A Fire, to massive acclaim. I’m A Fire landed on many BEST OF lists including Rolling Stone Country, NPR, iTunes and Billboard. And the album’s first single, “Whatever She’s Got,” was a No. 1 certified PLATINUM hit and was named one of the Top 3 country songs of 2014 by Billboard. Nail has been in the studio working on the followup to I’m A Fire. His current single “Nights On Fire,” from the upcoming new album, Fighter, is currently in the Top 30 and climbing on the country singles charts. No stranger to the road, Nail’s own headlining tour I’M A FIRE TOUR was named one of the Must See Concert Tours by Rolling Stone Country. He has toured with Taylor Swift, Darius Rucker, Lady Antebellum, Little Big Town, Sugarland, Gavin DeGraw and Kenny Chesney and most recently with Darius Rucker’s Southern Style Tour. Nail will be performing with opening acts Travace & the Generators and Blue Collar 40. Riverfest is providing this all ages concert for just the cost of an admission button. Buttons will be going on sale in late May and will be $7.00 in advance, $10 at the gate. As always buttons are good for all 4 days of fest which runs July 1st- July 4th and for ages 13 and up. Win a 2 night stay during Riverfest! Includes 2 night stay, meet & greet, entry buttons, $25.00 in food fair, and 10 beer tickets http://www.explorelacrosse.com/giveaways/riverfest-sweepstakes/.